As technology transforms the world of work, a generation of girls is in danger of being left behind. Globally, girls are underrepresented in science, technology, engineering, and mathematics (STEM) education. In celebration of the International Day of the Girl Child, Roya Mahboob and Fatemah Qaderyan discussed their experiences breaking barriers in STEM and what needs to be done to reduce the education gender gap. STONE: So we’re going to get started. Is everyone feeling good? This is the few, the proud, the breakfast crowd, CFR breakfast meeting. So I just wanted to welcome everyone. Good morning, my name is Meighan Stone, and I’m so honored to be a senior fellow here at the Council on Foreign Relations in our Women and Foreign Policy Program. Before I joined the team here at CFR, I worked with Malala Yousafzai, and I was the president of the Malala Fund, so—our youngest Nobel Peace Prize winner—so this is a particularly exciting day for me—International Day of the Girls, one of my favorite days on the calendar. And we’re really grateful that all of you made the time to join us today. Our mission here at the Women and Foreign Policy Program is to analyze how elevating the status of girls and women around the world furthers our U.S. policy objectives. So to that end, our conversation is actually on the record today; I know many conversations at CFR are not. This is a day where we want to encourage you to take your phone out and feel free to tweet. The hashtag is #CFRWomen—so #CFRWomen, and if you want to post a photo, or if you hear something today that’s particularly meaningful, that you want to expand the conversation beyond the Council and these walls, we want to encourage you to do that, and our team will engage with you on social. So we’re going to be having a presentation today to start. We’re going to mix it up. Today we’re going to have a bit of a TED Talk kind of 10-minute presentation from Fatemah. When I was your age there was no way I could have given that kind of talk—(laughter)—so I’m even more awed and honored by you, Fatemah. So she’s going to be presenting for about 10 minutes, and then we’re going to bring everyone up on stage to have a little bit of conversation. And then we’re going to open it up to Q&A as we always do at the Council. I want to especially encourage our younger attendees today—which means you are not an adult; you are a young woman or girl—to feel really bold about asking questions. We want to hear from you today. So today is really important because it is this International Day of the Girl. We’ve been celebrating this since 2011, and the goal of the day is really to celebrate girls’ extraordinary achievements and potential, and to take action to advance the rights and opportunities for girls everywhere. So having our guests today is right on point, all the more because they have a theme this year for International Day of the Girl, which is “A Skilled Workforce (sic; GirlForce).” So when we think about STEM, and tech, and digital—all the more relevant, and why not champion and celebrate girls and women doing this work in Afghanistan. We know we’ve had a lot of progress globally on girls and women in tech, but currently women hold only five percent of leadership positions in the tech industry, and only about three percent of ICT graduates globally are women. So we have a lot of ground to take. In Afghanistan specifically, we know that labor force participation rates with young women are particularly low, and we know that progress in education there can also sometimes be threatened by the security situation. And we even saw that secondary education for girls over the last few years in Afghanistan went from thirty-seven percent to thirty-five (percent.) So we want to see improvement. We’ve seen incredible efforts by the government of Afghanistan to continue to support those numbers. We’ve also seen cause for hope when we look at the parliament in Afghanistan, what are women doing when they graduate, when they’ve learned, when they’ve gotten their degrees. We see women holding 27.7 percent of seats in parliament in Afghanistan, and that number was only four percent in 1990—so cause for celebration and cause for more hard work together. I think all these statistics are why Roya’s work is so important in Afghanistan. We’re really excited to have you share with us today. My favorite fun fact about Roya is that she started her foundation operations trading bitcoin—(laughter)—to find resources to support her work, so her creativity and commitment are unparalleled. So today we just want to have this conversation on the International Day of the Girl to explore how we can expand learning opportunities and prepare girls to join this workforce of the future. So we’re thrilled and honored to have our guests here today, Roya Mahboob and Fatemah Qaderyan, and then also Kawsar Roshan has joined us as well, so we have an additional member of the Afghan robotics team. We are so thrilled that all of you are here. Roya is the founder and CEO of Digital Citizen Fund, which is a nonprofit that is increasing women’s technological literacy and providing employment and educational opportunities to girls across Afghanistan. She is one of Afghanistan’s first women tech CEOs, and she was named one of Time’s most a hundred influential people in the world because of her innovative initiatives in Afghanistan and globally to expand computer education. So we’re thrilled to have you, Roya. 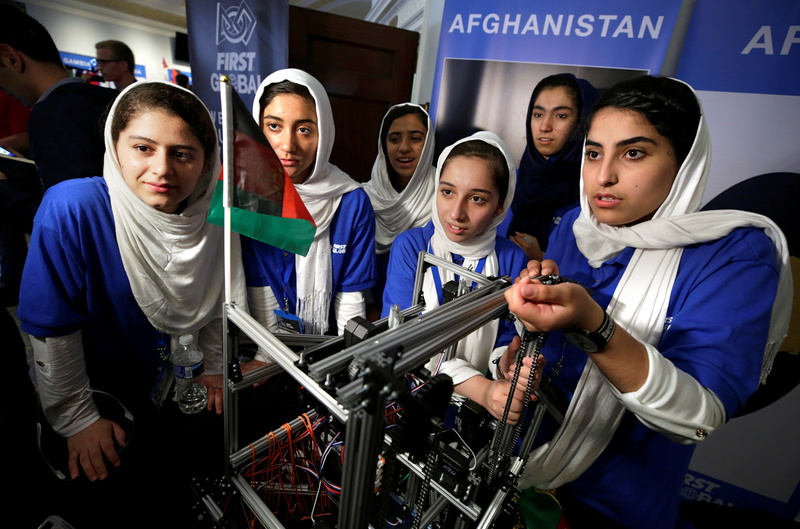 STONE: Fatemah is the captain and the spokesperson of Afghanistan’s all-female, high school robotics team. She is 16 years old. I think you’re our first young woman to have speak at the Council in quite a while, if not ever, so this is a good day. We’re so glad you are here. She is an eleventh-grade student, so she is off from school to spend time with us today. She goes to Mehri High School in Herat, Afghanistan, and she actually wrote her first book, My Afghanistan, at the age of thirteen. And she is currently working on her second book. So we really admire that at the Council because we like to write books here, and to think that you’ve already got one done and you are working on your second is really impressive. QADERYAN: (Through interpreter.) Salaam. This is not a greeting only from me, but it’s from all the young females from Afghanistan to you. I was six years old when I first saw the cartoon called I Robots (sp), and it was so interesting to me that how the robots could talk, and they could walk like humans. I became so curious about the technology works, and this was the first time that no one could answer my questions. After a time, my imagination grew and became a dream. I wanted to go to the school to learn as much as I could so I could one day build robots of my own. But I wasn’t aware of the danger of dreaming in my country. In my country, girls are not supposed to be curious, and instead they should be—(inaudible)—and shy. My mother told me stories about the dark area of the Taliban who would force women to stay inside of their homes so they would be easier to control. The Taliban insisted that the mullahs’ roles to be accepted as the truth. And they destroyed the power of the knowledge and imagination and left no room for innovation. They keep everyone in dark in the name of Islam and Sharia law. Even taught everywhere in Quran, curiosity and scholarship are encouraged. Today Afghanistan is a place where Rokhsana was stoned, where Farkhunda was (burned ? ), and where women are murdered, but here are still sign of the hope. But due to the economic priority, teacher shortage, lack of opportunity, and the Taliban continued presence in the part of the country, many of the girls and children are still denied access to education. And even when the girls have the opportunity, cultural barriers and prejudices stand in their way. My team and I faced these challenges when we started our robotic team. The Afghan Dreamers started through a program run by Digital Citizen Fund, and our teacher was Alerazami Harimon (ph). Many of my relatives didn’t understand and support my interest in science and technology, especially because mechanic is such a male-dominated field. My father was the only one who supported, and encouraged me, and helped me to go every way. When we got the opportunity to go to the competition, we were so excited, but many girls couldn’t participate because their families were very conservative. One of our challenges was that our visa was denied, but finally, with intervention from president of United States, President Trump, we could finally get the visa. We broke our silence and spoke out, and our story reached millions of the people through the TVs and social media, and fifty-three congressmen signed a petition to us. And finally we could win and we could come back with the medal of silvers to our country. This medal sent a message to everyone who doubted us. We proved that if you giving a chance to the young girls we will be able to reach our full potential and will hold the Afghan flag with our pride. A week after our return to Afghanistan, ISIS took my father from me. I always believe that there is always a hero in the life of a child. And my father was my hero. A year has passed, but still I can’t believe that he is gone. It seems to me that good people die before their time. Everything is in a child that start with imagination. After a while, imagination grew and become a dream. Once they had a dream, they want to achieve in their reality. Children of conflict only knows the blackness of the blood and the redness of the blood. But they know that the condition in their country has forced them to only have access to two color from the whole pattern, no more. Many people in older generation continues to hold the prejudices told to them by the Taliban, but my generation is different. Children or young adults make up over fifty percent of our society population. Leadership must be in the hands of the young, the generation, and consider technology as weapon of the peace, but not the generation that consider Afghan (foes as brothers ?). We are the children of the war, but we have proven that hope still exists. Hope is what builds my today and your tomorrow. My friend and I were the ones who plant the first seed of the science, technology, engineering, art, and maths, and today we are harvesting the result. We had a chance to meet with president of Afghanistan, Ashraf Ghani, and sharing our plan to build the first school of science, technology, engineering, art, and maths in Afghanistan, and we are still surprised that he has not only accept one, but he wants to build five in five zone of Afghanistan. We are today—are the people who started a revolution of the technology in our country, and we still know that there are lots of the problem exists in our way, but we are trying to stand in front of all of those. And we have proven that sometimes a small opportunity can change the story in (a country ?). And we are happy that—to proving the importance of the STEAM education for not only our leaders, but also for our communities, and we are trying to—building the schools. And we were proving that today the pencils is on the hands of the young generation, and we are going to change the world. A thousand years ago, Afghanistan produced scholars like Abul Alecena (ph) and al-Biruni, who is scholars in math, and science, and philosophy, but influence and highly regarded around the world. Now it’s our turn to write the pages of our story through knowledge and technology. The children in my country no longer want to hear the sounds of the gun and bullets. We do not want to be bystanders. We wants to become the actors. We do not want to live in the fear of the distribution of international imports or relationship. We want to produce and be exports. This is why we have started technology revolution in our country. And I want to change your image of our country. My teammate and I know the danger under the water and, yes, we know that there are sharks that want to make us their prey. But we also know that there are shiny pearls in the depths of the ocean. We will go to them by swimming in the deepest water and we will harvest those pearls. STONE: Thank you. Thank you so much. Thank you for sharing that. I still can’t believe you’re sixteen and just gave that speech. I can’t speak like that now and I’m way older. So we’re going to have our team bring up some chairs so we can sit and have a conversation together. So, Fatemah, if you want to—if you want to come back here, they’re going to bring all this up. We’re going to welcome Kawsar and Roya actually to come up and start our conversation. And so this is a good time to start thinking about your questions as well because we’re going to open that up in just a moment. So I want to start with Roya actually and just talk about what Fatemah just shared about wanting to change the image that many people have of Afghanistan, of your nation. And I’m wondering if you can share with us about this vision that you have to build the first high school that is STEM-focused for girls in Afghanistan. And what caused you to develop that vision? And why do you think this project is so important? MAHBOOB: Sure, and thank you. I think that I have to a little bit give you the background about myself and why we came up with this idea. I’m a tech entrepreneur from Afghanistan and I also ran a foundation called Digital Citizen Fund, that we are trying to empower women through digital literacy and providing education and financial literacy. We have helped thirteen thousand local girls to come through our program. We have different programs, from coding, building applications, games, and financial literacy to help them to start their own startups. But two years ago when we started a robotic team, things have changed. I mean, many of our projects had important impacts in our society, but I think that this one was a bit different. It was just was, like, a spark in the darkness and it has changed. After they come to the United States and they come back to their countries, they have been changed the view of so many people in the community, in the leadership, and in the politicians, and economics. So that was for us a hope to continue, to not let this light to be turned off. So we went to do so many competitions and they win some of the medals and they meet with lots of the leaders. And it has changed the view of the Afghan people, especially men, on the women’s ability in science and technology. And we have forty-one percent of our population lives under the age of eighteen—under the age of fifteen. And in order to compete in twenty-first century, we have to—the countries must have access to groundbreaking technologies. And unfortunately, inequality to access this education still exists and especially in the area of a third-world country, and Afghanistan is one of those countries that they don’t have that access. And what we want today is to build the first school of science, technology, engineering, art, and math in Afghanistan to build the next generation of the young leaders in science and technology. And we’re three years along to building the MIT-style university focusing on high tech and hopefully to see Afghanistan within the next ten years as a country with sources of high tech for their country. STONE: That is a great goal. I love that you talk about how you’re changing the perceptions of men in Afghanistan about what girls and women are capable of. And you’re just showing by doing, you’re leading by taking action. And I wanted just to ask about, you know, allies as we call them here in the states, so, you know, men that support, boys and men that support your work. I know, you know, Fatemah, when you shared so powerfully about your dad and about losing your dad and how he loved you so much and how he always supported you and celebrated how curious and inquisitive and intelligent you are and that he’s still in your heart today, you know, helping guide you. You know, I’m wondering if you can share about men that—you know, what is that interaction like with men around this or men who have been supportive? You know, I think about Malala’s father always saying that all he did was not clip his daughter’s wings and just let her fly. And, you know, I think there’s some real wisdom in there. I don’t know if you want to translate, Roya, the question for them. MAHBOOB: She says that Afghanistan is very male dominated and very conservative. And if you don’t have the family support as a first thing, it’s not possible that you can continue your education or your growth. So for her, it was her father who supported her and that’s why she did succeed. And she said that at the beginning, the men in Afghanistan doubted their abilities, but today many of the families have changed views, especially men in their families on the women’s ability in science and technology and they supportive of this cause. And I have to also mention that lots of—we couldn’t be here today if the men didn’t help us and support us in this progress. And I guess it started from, first, from their coach that was a man, and then lots of others. Ambassador Mohib, he was very supportive of us. STONE: The ambassador of Afghanistan to the United States, who’s now the national security adviser to President Ghani, has been a big champion. MAHBOOB: Yes, he was a very big champion and he is still very supportive of us. And there are lots of other men in Afghanistan on the ground helping us to build these schools and building on our ability. And actually, they lobby for us. So also, I think that it’s very important to say that’s an important role of men in our success and especially for the future if you wanted to bring the change, because I think that this is a collaboration, it’s not, like, one, we only as women can go. We can go, but if we have the support of the men, we can do it faster. STONE: I think that’s such an important message and especially as people think about Afghanistan. I don’t know if you’ve heard, here in this country we’re still working on that issue as well, so we’re joined in that. I want to ask a question to Kawsar before we open it up to our guests. And so I don’t know if Kawsar wants to share about her own experience about what barriers she overcame in her life to be able to become part of the team. And I have to say I want one of the uniforms because they’re amazing. (Laughter.) They’re phenomenal. But what did—what did Kawsar overcome in her own experience to become part of the team? MAHBOOB: She also mentioned that Afghanistan is a—is a country of male dominated and very conservative. And the women—we have very few women in the leadership of technology, so that’s also very challenging because they don’t have enough role models to look at. And for her, it’s just she lost her father when she was three years old. And her mom and her sister were supportive of her that she could come and joining to this team. And she was very interested in technology and science when she was a child because she likes the complex problems, to solve it. STONE: Well, we’re—if you can share with them we’re just really humbled by both of your strength and bravery and courage and commitment, especially losing family and still pressing on and achieving their dreams is really incredible. And we’re proud of you and we’re grateful you’re here. STONE: All right. So we’re going to open it up to questions. What we do at the Council is, if you have a question, go ahead and put your placard up and we will call on you. So feel free to put up—I see a young woman putting her placard up first, Sophia. So are you ready to ask your question? Q: Yes, I actually have three of them. STONE: You have three? Well, this is a great educational moment. Your dad is training you here. (Laughter.) So we have a rule here against speeches and multiple questions. (Laughter.) If there was anyone to break it, it would be you. How old are you? What grade are you in? Q: I’m eleven and I’m in sixth grade. STONE: You’re eleven and in sixth grade. I really want to bend the rules for you, but why don’t we—why don’t we see how you do with your first question and if we run out of questions we’ll come back to you. Is it a deal? STONE: All right. Sophia, we’re ready for you. Q: How have your achievements affected women’s position in your society and community? STONE: Awesome, that’s a good question. MAHBOOB: That’s a good question. MAHBOOB: She said that we receive a lot of the awards and the medals. We received the congratulations. We’ve been in Estonia. And all of these awards actually are giving a message to the very conservative men in Afghanistan, if they give a chance to women to go on in the competition, they can make the—they come back very proud and they make the flag of Afghanistan show to the world the abilities of women in this field. So that has changed the view of the men in the country. Q: Can I go on with my second? STONE: We’ll give you a follow up. We’ll give you one follow up, Sophia. What’s your—what’s your follow-up question? You can have one follow up. STONE: No one tell Richard Haass, all right? (Laughter.) Tell us? Q: How have your achievements affected schooling in your community? MAHBOOB: School in the community? MAHBOOB: So they say that when we—we are—we are part of different schools with a different number of students, like, for example, between five (thousand) to six thousand students because they are part of public schools, government schools. So when they come back, they’re providing the training and workshops for the students inside of the schools. But in general, they created—as Fatemah says, that we become a role model for the girls. And right now, competition is getting very tight and less of the girls want to be participants in robotics and this field. STONE: Great follow up. We see you in the White House press corps in the near future. Why don’t we go to Holly, we’ll go around the table? Q: Don’t you want to ask us—(inaudible)—ask my question? Q: She has her own question. STONE: —after Holly, how about that? We’ll start with Holly and then go to Maeve. Q: Oh, OK. So Fatemah and Kawsar, in ten years from today, where are you going to be and what are you going to be doing? MAHBOOB: She wants to say in general and then also she wants to say the personal. MAHBOOB: So she says that Afghanistan within the next ten years is a country of innovation and technology. And she says that we want to go to this field to learn about STEAM and also becoming—she wants to grow to be a specialist in AI and come back to the country. And because they have all these schools, they want to teach students there and give back to their communities and helping to be a country to working on innovation, bringing new products and new ideas. And she thinks that in the next ten years, Afghanistan has a lot of awards not only in the country, but also in the region in terms of innovation in AI and robotics. STONE: We’ll go to Maeve. Do you have a question? Q: All right, yeah. If not everyone wants to be involved in robotics and not all the girls know they can be involved in robotics and technology, what are some ways you would want to inspire them and bring these opportunities to them? MAHBOOB: So she says that the STEAM education is very male dominated and more than eighty percent are right now in the hands of men. And she thinks that it’s very important that the girls get involved because it’s such a—such a field to create more creativity and you can be more creative and you can also solve complex problems, that it will help you to not only build your personal life, but also it helps you to build your future. MAHBOOB: And the future is about STEAM. And if the girls are not getting involved, they are going to lose opportunities in the future because, first of all, in the next ten or twenty years, the jobs in the industry will be double and then lots of high salary would be another thing, an option that the woman could have. MAHBOOB: And if they get involved, they can also increase their income and also help support their families and also grow the economy of their country, they can be part of the growth of the economy. MAHBOOB: Like, for example, we should look at the cybersecurity which is a very important thing for the security of the country. And many of the sites we see that it was hacking, and especially in Afghanistan we don’t have that expertise. But by 2020, we need a lot of the jobs in cybersecurity and we need to have women to be represented in this field as well. So I have to imagine that you, Roya, and all of the students on the team are great role models in this. You know, it’s like we always say, you can’t be what you don’t see. And, you know, being able to be visible and see makes a big difference. I want to go around the table and come to Emily for your question. Q: Hi. So my question is, like, how do you hope that international, like, organizations get involved and, like, help you further your goals? Because there’s been such a big focus on, like, improving women’s access to education and, like, including women in, like, the technology field? STONE: Roya, if you want to, you can start with that one, too, after you translate maybe as well, yeah. MAHBOOB: So she says that investing in STEAM education for young girls if very important because they are living in society and also they know lots of the problems inside of the families and the environment and the community. And if they get involved with this education, they can bring better productivity in the country. But I think also that, as Fatemah says, investing. And also, what we need is funding and we need resources. And if the organization wants to join forces, we would welcome them. And right now, we’re going to build not one school, five schools in five zones and we’re going to build a university. So I think that the main part of that is we need funding. And we would to be partners with organizations who are interested in this, that want to be part of this revolution in Afghanistan. We would welcome them to join us. STONE: That’s good. I think our hope in having these conversations is being able to be an earnest broker for people that are caring about specific issues to come together and find ways to take action outside this room. So be sure to talk to Roya after if you want to be part of not just being inspired this morning, but actually doing something. I’m sure she would love to have that conversation. I’m going to go to Samantha for our next question. Q: Hi. Your work has truly sparked a fire internationally on trying to integrate women into the global workforce, especially within male-dominated fields. So my question for you is, how do you think your work will impact not only the newer, younger generations, but the older generations as well who have their own already preconceived perception of women and where they should be in the workforce? MAHBOOB: I will respond to this question. I think that we already—we are not only going to meet with the younger generation, but also we had a chance to meet with lots of the leaders in politics and religion and economics in Afghanistan. And it’s interesting that we saw that the changes happened in them as well and they understand the importance of the knowledge and especially technology as a tool to improve the economy of the country and security and the future of Afghanistan. And we’re not only going to change that view in Afghanistan, but the good thing is that we go to other countries, we meet with lots of the leaders there. And recently, a month ago, we were in Mexico and met with the minister of development there. And interestingly, we discussed about technology and what we have to plan for Afghanistan and they got so interested. And they asked the team to lead their force in Mexico and help them to build their own first STEAM education, first STEAM schools in Mexico. So right now we are working with them as well. So I think that it’s not only for the younger generation, but also for the older generation. And it’s good that they understand that this is very important. STONE: Yeah, that’s so important. I mean, a statistic that really resonated with me when we were preparing for this discussion is that in the next decade six hundred million adolescent girls will enter the workforce—six hundred million over the next decade—so we need to get this right for that generation and for generations that are also figuring out how to come to terms with the digital evolving workforce and economy. So we’ll go back around the table, so I want to go to my colleague here. Did you work out a deal—you’re now—you’re now reading her third question? This is a natural diplomat right here. Q: Well, OK. What is your favorite problem or what has been your favorite project or robot that you’ve worked on? STONE: Maybe give that to Kawsar so we can hear from her as well. MAHBOOB: So one of my favorite projects was the robots that we prototyped for the farmers. We did an interview with lots of the farmers, the small farmers in Herat to see what’s your problem. And then we designed a robot to helping to cut and package and process the wheat. And this is a prototype that they have done. And it’s reduced the time and it’s increased their productivity and also it’s very—it’s good for the small farmers to use these small machines for their work. So that’s one of the favorite projects and they are working on that. STONE: Great. We’ll keep going around I think to—does your father have a question as well? STONE: OK. Well done. All right. I see you—yeah. Q: What other girl teams have you met? STONE: What other girl teams have you met? Have you run into a lot of all-girls robotics teams on the high-stakes robotics team circuit? Have you—have you run into many other all-women teams? MAHBOOB: I think so because they are going to compete—going to different competitions, so they meet with lots of the teams that are working on robotics. Like, for example, they were almost four months in Canada for the first competition and they met with lots of the teams that are girls and they build robots. So they had the chance to working with the students as well. Q: Were there any all-girls teams from a non-Western country? MAHBOOB: So they forgot, there was one of the African countries that they met in Mexico that they were all girls. And then also, the coach was a female, so that was also another team that they met. STONE: So one question from me about just the high school—the high school—the five high schools, right, that you’re looking to start in Afghanistan. What kind of curriculum, what kind of skills are you looking to teach in those schools as you’re talking to partners and donors and friends who want to support this program? What kind of educational opportunities do you foresee girls being able to access in those high schools? MAHBOOB: So this is a program that we are working with our different partners. More focus would be on AI and robotics, but it would—it would be based on the standard or the curriculum that the United States and Canada, they’re teaching in their STEAM schools. So we will take that, but we will a little bit adopt it with Afghan society needs. But then our focus more will be, again, on AI and robotics. And we are right now working with our partners on developing a good curriculum for this. And the idea is that from ninth grade we take an exam from the students on logic and mathematics. And once they take this exam, the best students can go and enter into this—to this—for the high school for ten, eleven, and twelfth grade. And then the training would be—everything would be in English. So we’re going to have the professor, we think that they will come and they’ll do lectures in Afghanistan. And we’re going to have also online training for them, virtual training for the students in some subjects. But also, we already find lots of the Afghans who got their master’s from AI or from different computer science or engineering from the United States and Europe, so we’re going to have also resources there from inside of Afghanistan for that, for the program. STONE: I think it’s so powerful because it really flips the script on what people think about girls and women in Afghanistan, girls and women, you know, writ large in terms of tech and AI. I see one last question here from Christopher Brogan. Q: One of the—one thing that’s evolving is not just STEM, but adding the A for arts as we move forward. And clearly, Fatemah has got her second book in the works. So I’m curious as to how—do they have artistic pursuits that help feed that creativity as it relates back to technology? MAHBOOB: Well, I—well, we have science, technology, engineering, art, and math, so it’s STEAM, so have included art, which is very important, in our curriculum. STONE: Do you—do either of the students, do either of you pursue anything in the realm of arts? Of course, Afghanistan has a rich artistic history as well. It’s pretty extraordinary. STONE: Yes, I love it. Well, the last question I want to close with is just to—because this is International Day of the Girl and it is meant to celebrate the achievement of girls and girls who also become women one day. And I wonder if we could just go down and each of you can just share with us something that you’re most proud about in this work, because you’ve overcome a lot. You know, when I think about last year with everything around the visa process, your visas getting rejected, and then there was—it was pretty extraordinary for someone that cares about girls and women in the region to see the whole world really get engaged for a couple of news cycles about would you get the visa or not was really wonderful and extraordinary to see the outpouring of support. And, you know, you’ve had so many achievements and successes since and I know many things that you overcame to even get to this point. So perhaps each of you could share something that you’re proud about that we could join you in being celebratory about today. And we’ll bring it to a close after that. So do you want to share the question, Roya, and then you can kick us off? MAHBOOB: I would say very small that imagination is powerful, dream big because that’s what we did. MAHBOOB: So whatever you believe, stand on your belief, even if there was no one standing with you. And always fight for what you believe. And also, persistence is one of the things that you can get it and don’t give up on the things that you believe on that. MAHBOOB: Always imagine what and who you want to be. And I always dreamed to be one day a mechanical engineer and today now I have that opportunity to become. STONE: That’s so powerful. Well, we’re so honored that you came all the way from Herat, Afghanistan to be with us today. You know, what a wonderful moment we even had before we started today about how the Council, we’re all connected in ways we don’t even expect. One of our member’s—Jeffrey’s daughter Eleanor is actually a robotics team high school student here in the area and was actually part of the petition process to bring you to the states and I know sent a gift this morning. So young women are connected in ways we didn’t even realize. So let’s give our speakers a round of applause. Thank you so much for joining us. (Applause.) If not the first time that we had a young woman under the age of eighteen speak at the Council, certainly the first time we’ve had at least fifty percent of a discussion be young women, so this is a historic moment for CFR. (Laughter.) Thank you so much. And I think if we wanted—if anybody wants a photo with you maybe, would you be willing to agree? If anyone wants to come up and have a photo after, I would be happy to take a couple of photos before their next engagement. So thank you so much.